The Gods Must Be Crazy is a 1980 South African comedy film written and directed by Jamie Uys. Financed only from local sources, it is the most commercially successful release in the history of South Africa's film industry. Originally released in 1980, the film is the first in The Gods Must Be Crazy series. It is followed by one official sequel, The Gods Must Be Crazy II, released by Columbia Pictures. Set in Botswana, it follows the story of Xi, a San of the Kalahari Desert (played by Namibian San farmer Nǃxau ǂToma) whose tribe has no knowledge of the world beyond, Andrew Steyn (Marius Weyers), a biologist who analyzes manure samples for his PhD dissertation, and Kate Thompson (Sandra Prinsloo), a newly hired village school teacher. Xi and his San tribe of Ju'/Hoansi bushmen are living happily in the Kalahari Desert. One day, a glass Coca-Cola bottle is carelessly thrown out of an airplane and falls to Earth unbroken. Initially, Xi's people assume this strange artifact is a "present" from the gods just as they believe plants and animals are and find many uses for it. Unlike other bounties, however, there is only one glass bottle , which causes conflict within the tribe. Consequently, Xi confers with elders and agrees to make a pilgrimage to the edge of the world and dispose of the supposedly cursed thing. Along the way, he encounters diverse people, such as: biologist Andrew Steyn, who is studying the wildlife; Steyn's assistant and mechanic, M'pudi; Kate Thompson, the newly hired village school teacher; a band of guerrillas led by Sam Boga, who are being pursued by government troops after a failed assassination attempt; and a safari tour guide named Jack Hind. When Xi, hungry, happens upon a herd of goats, he shoots one with a tranquilizer arrow, but is caught and jailed. M'pudi, who once lived with the San and still speaks Xi's language, concludes that Xi will die if kept incarcerated. He and Steyn consequently apply to employ Xi as a tracker for the remainder of his sentence in lieu of prison. Meanwhile, the guerrillas invade Kate's school and take her and the students as human shields for their escape to a neighboring country. Steyn, M'pudi, and Xi immersed in their fieldwork find that they are along the terrorists' chosen path. They manage to immobilize the guerrillas using makeshift tranquilizer darts launched by Xi with a tiny, silent, and concealable bow that M'pudi and Xi fabricate, and save Kate and the children. However, Jack Hind arrives and takes away Kate, taking credit for the rescue that Steyn, M'pudi and Xi had actually planned and executed. With Xi's term over, Steyn pays his wages and sends him on his way. When Steyn tells Kate about his shy and awkward nature, Kate finds it endearing and they begin a relationship. Xi eventually arrives at God's Window, the top of a cliff with a solid layer of low-lying clouds obscuring the landscape below. Convinced that he has reached the edge of the world, he throws the bottle off the cliff, and returns to his tribe. The Gods Must Be Crazy was released in South Africa in 1980 by Ster Kinekor Pictures; it became a box-office record breaker in that country. :77 For the film's overseas release, the original Afrikaans dialogue was dubbed into English, and voiceover work was provided for !Kung and Tswana lines. :76 At the time, it broke all box office records in Japan and it broke all box office records for a foreign film in the United States. In mid-November 1986, The Gods Must Be Crazy was released on videocassette in the U.S. by CBS/Fox on its Playhouse Video label. Based on 19 reviews, The Gods Must Be Crazy has carried a 95% "Fresh" score on Rotten Tomatoes. Film critic Roger Ebert gave the film three stars out of four, and said in his conclusion: "It might be easy to make a farce about screwball happenings in the desert, but it's a lot harder to create a funny interaction between nature and human nature. This movie's a nice little treasure". ^ a b c Pfaff, Françoise (2004). Focus on African Films. Indiana University Press. ISBN 0-253-21668-0. ^ Gugler, Josef (2003). African Film: Re-imagining a Continent. Indiana University Press. p. 74. ISBN 0-253-21643-5. Retrieved 13 June 2010. ^ a b Gorelik, Boris (12 July 2014). "Jamie se treffer: Met Uys, ja – die wêreld in". Rapport. Media24. Retrieved 14 July 2014. ^ James, Caryn (14 July 1987). 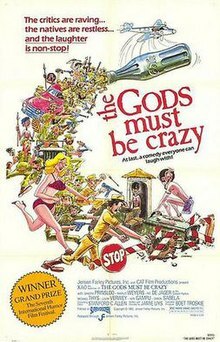 "The Gods Must Be Crazy (1981): Home Videos; Sophisticated Silliness". The New York Times. The New York Times Company. Retrieved 7 August 2010. ^ "Reviews for The Gods Must Be Crazy". Rotten Tomatoes. Flixster. Retrieved 20 June 2016. ^ "The Gods Must Be Crazy Movie Review". Chicago Sun-Times. Retrieved 9 February 2014. ^ "Movies of the 80s [Flash Back Wednesday]: The Gods Must Be Crazy". Clue Magazine. 14 March 2012. ^ Lee, Richard (2003). The Dobe Ju/'hoansi. Case Studies in Cultural Anthropology (3rd ed.). Wadsworth Publishing. ISBN 0-03-032284-7. Klemesrud, Judy (28 April 1985). "'THE GODS MUST BE CRAZY' - A TRULY INTERNATIONAL HIT". The New York Times. "Box Office History for Gods Must Be Crazy Movies". The Numbers.